August 17, 2017 – Montreal, Quebec – Critical Elements Corporation (“Critical Elements” or the “Company”) (TSX-V: CRE) (US OTCQX: CRECF) (FSE: F12) and Lepidico Ltd (ASX: LPD) (“Lepidico”) are pleased to advise of results of the second stage of drilling at the Lemare spodumene project in Quebec, Canada. 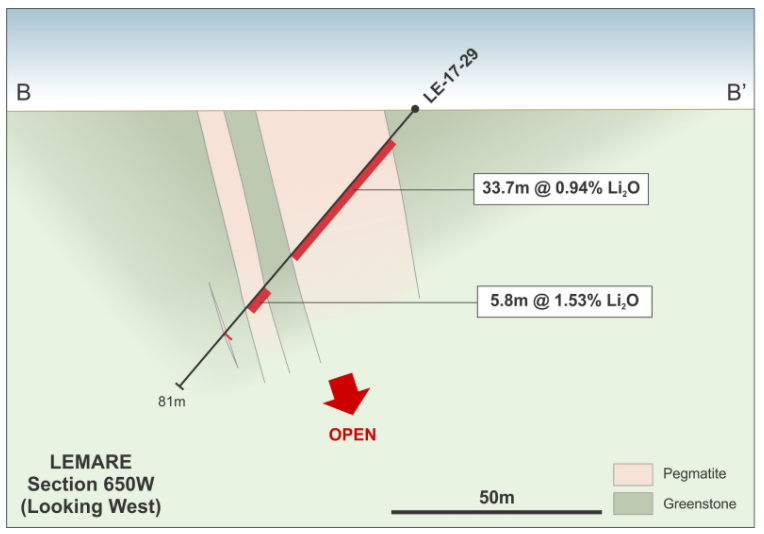 The Stage 2 diamond drilling program was completed along the 600 metre long SW Extension of the Lemare spodumene pegmatite, following on from the Stage 1 drilling in 2016 over the main Lemare prospect. A lake covers the intervening 300 metres between the two prospects (Figures 1 -3). 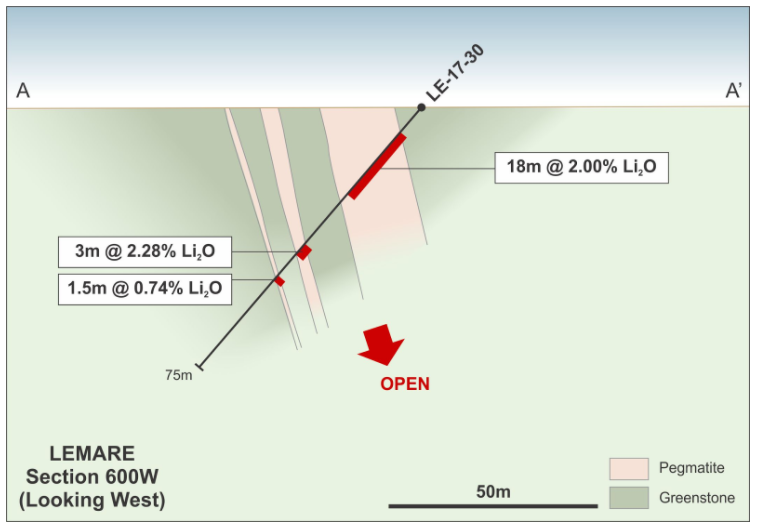 A total of 15 holes, for 1,527 m of NQ core, were drilled on nominal 50 m sections along the 600 m long extension of the spodumene-bearing pegmatite corridor to the SW of the lake. A full list of significant intercepts (>0.5% Li2O) from the SW Extension program is presented in Table 1. 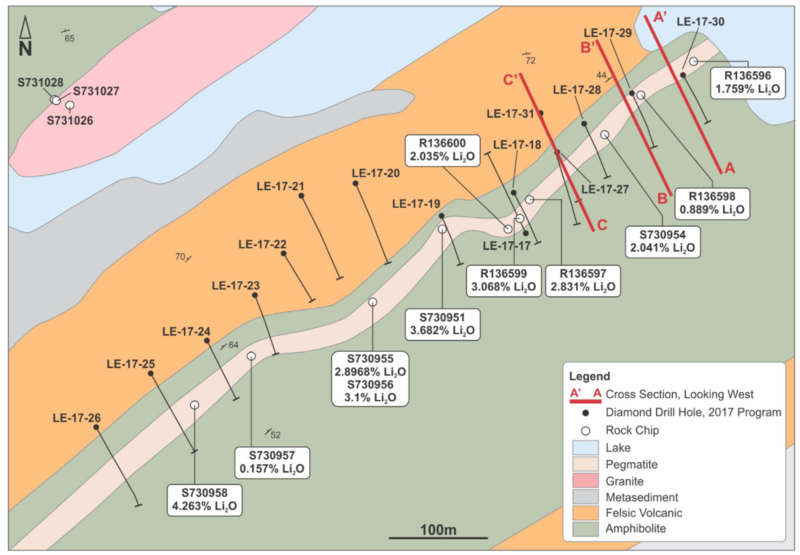 Good widths of spodumene-bearing pegmatite are recorded in the eastern 250 m section of the corridor, and remain open at depth, as shown in Figures 4, 5 and 6. Geological logs show spodumene content ranging from 5% up to 25%. 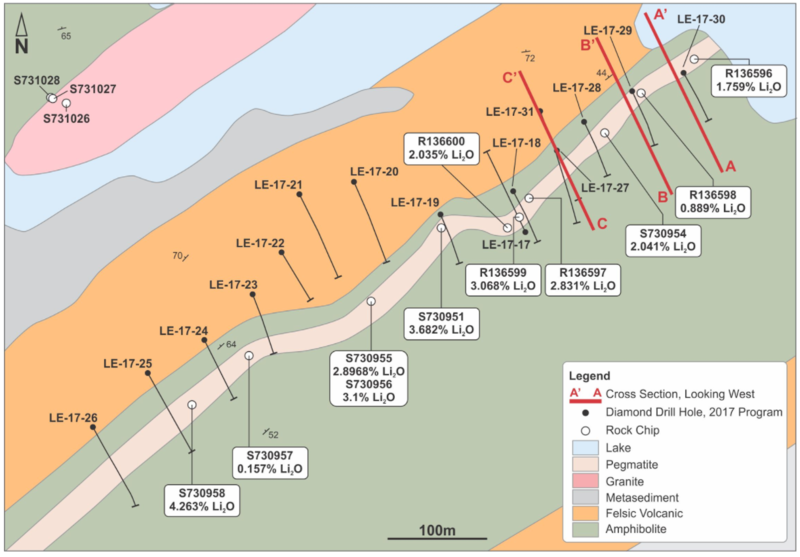 Results from drilling to the west of a sharp inflection in the interpreted position of the corridor, spodumene pegmatites thin or were not intersected at depth by the drilling. This is similar to the pinch-and-swell character of the pegmatites seen at the main Lemare prospect 300 m to the northeast across the lake. Figure 3. 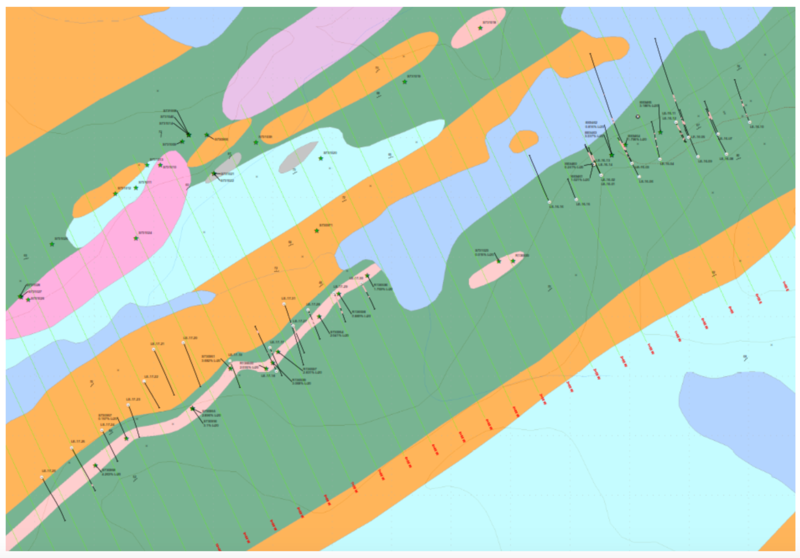 Lemare SW Extension, simplified geology showing location of drill holes and cross-sections presented in Figures 4 – 6. Figure 4. Lemare SW Extension, cross-section 600W. Figure 5. Lemare Extension, cross-section 650W. Figure 6. Lemare SW Extension, cross-section 725W. 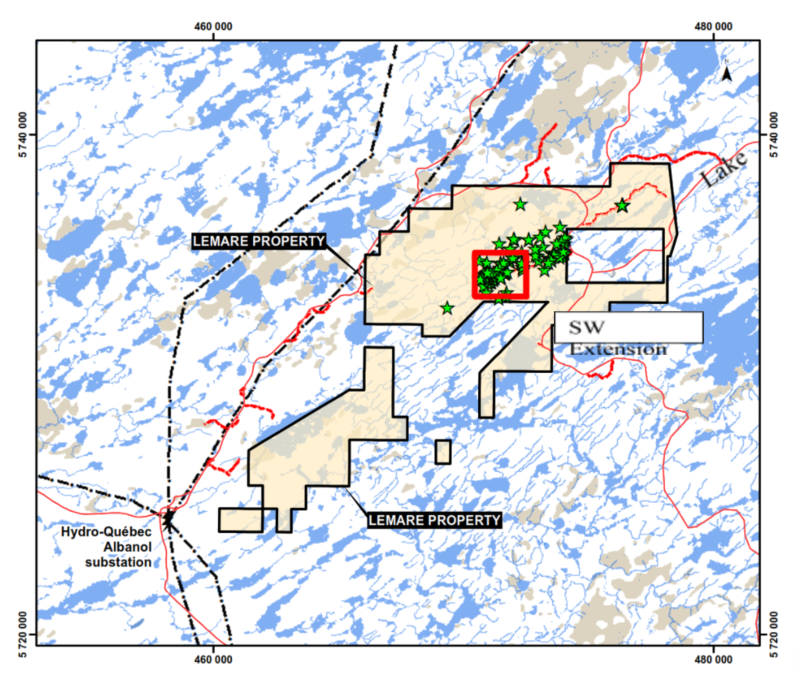 The Lemare spodumene project is some 70 km2 in area and is secured by the Lemare Option Agreement between the Company and Platypus Minerals Ltd. Under the terms of the Lemare Option Agreement, Lepidico Ltd is earning up to a 75% interest in the Lemare project. To maintain its position, Lepidico Ltd has an initial requirement to spend C$800,000 on exploration by August 31, 2017 (extended from December 31, 2016 by agreement). With completion of the Stage 2 drilling program Lepidico has met this expenditure requirement. The Companies are pleased by the strong results generated from Lemare to date, which show Lemare to be a promising target with prospectivity for a significant spodumene resource. To complete the earn of an initial 50% interest in the project, Lepidico is to fund C$1.2M of exploration and delineate a JORC Code compliant Minerals Resource by August 31, 2018. Lepidico can earn a further 25% interest by completing a feasibility study and an environmental study on Lemare by June 30, 2020 and by making a payment of C$2.5M (in cash or shares) to Critical Elements. 2) Lemare drilling reported to ASX on November 24, 2016 (under ASX code PLP).